So much to do in this wonderful city. Highlights for everyone. Cool biking & surfing on Santa Monica beach. The Getty Museum – just amazing. Something for everyone and fantastic views. A bit of La La Land at the Griffin Observatory in Hollywood or take in a baseball game. We have some great restaurant recommendations – only known to those on the ground and even better – we can get you behind the scenes and first on the rides at Universal – you wouldn’t want to do it any other way! From LA you can easily whizz down to San Diego or up to the beautiful beaches at Santa Barbara. Up the Coast to Northern California – the Big Sur has now re-opened. Northern California is really a separate trip in itself – and ideally between September & November when the days are clear and warm! Consider heading out to the Channel Island Sea Caves on Kayaks with one of our guides. A full day, in and out of the sea caves, abundant marine life & seabirds. Kelp forests, rugged cliffs and the chance to snorkel. Further north, what about an Eco Whale Watching trip at Monterey? We use the smaller open boats so you can see humpbacks, orcas, blue whales, dolphins, seabirds and seals. A beautiful coastline and then a visit to the well-known Monterey Aquarium at the end – we get you behind the scenes through the staff doors – seeing it from the other side. Yosemite National Park – stuck by so many fires this summer part of the valley was closed. However, it was still a highlight for our clients who stayed within the park – so beautiful, sequoia trees, granite cliffs, wilderness hikes and beautiful lakes. A few hours’ drive would bring you to San Francisco – sometimes blighted by fog in the summer months but a total contrast to Los Angeles in the South and easy to get around by tram or bike. Over the Golden Gate Bridge, up the cable cars and over the water to visit Alcatraz Island – you need to be on the ball to get tickets sorted in high season. Great markets and a huge variety of places to eat out. What about a quick trip up to Napa Valley north of San Francisco. It’s known for hundreds of hillside vineyards in the Napa Valley wine region. In the city of Napa, Oxbow Public Market features regional gourmet food. The Napa Valley Wine Train is a vintage locomotive and traveling restaurant running through the valley. Northwest of Napa is Yountville, a town known for high-end restaurants and sparkling wine. Las Vegas and the Hoover Dam. The latter being a highlight for us, and a breathtaking engineering feet. Las Vegas still amazing – despite being 46 degrees – in the shade – and at 11pm at night! UTAH – the Other National Parks we recommend; Zion National Park followed by Bryce Canyon – again, in high season, get there early – the early sunrise on Bryce Canyon was breathtakingly beautiful – and great hiking in all these parks. Continuing north, the drive is through some of the most stunning desert and canyon scenery you can imagine. 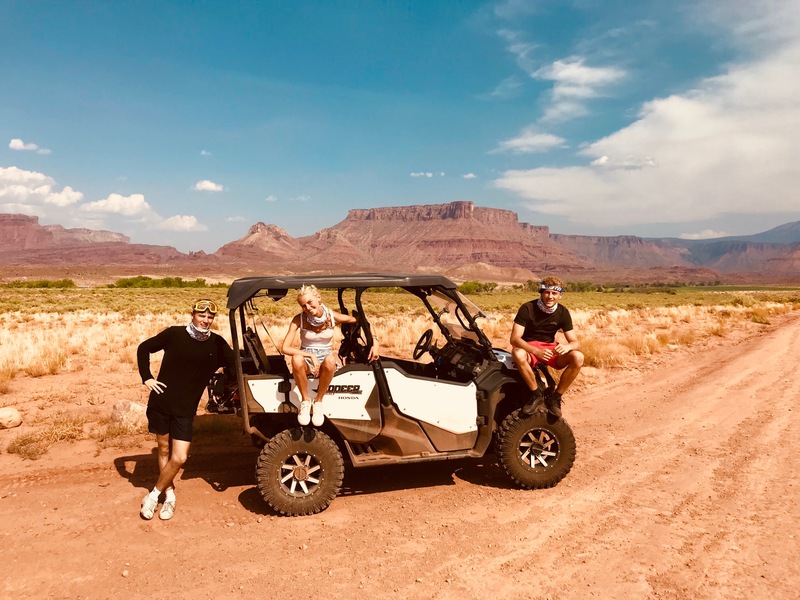 We headed over towards the Colorado border and found a very special ranch on the side of the Colorado River from which you can visit the Arches National Park and the totally unspoiled Canyonlands. A great off road day trip – staggering scenery enlightened with one of our geologists. “Pink” Sedona such a cool place to visit, magical, mystical and we have just the spot for some sport, golf and down time. Self-drive UTVs for those petrol heads. Cowboy time and Monument Valley, the Painted Desert, the Canyon de Chelly. The Grand Canyon could not possibly disappoint – particularly if you visit early in the morning when the light is so clear. It is extremely busy however, we can get you right away from the crowds and down into the Canyon with one of our guides. There is always the helicopter ride and of course the amazing National Geographic IMAX cinema. A fabulous holiday for the Flory family!